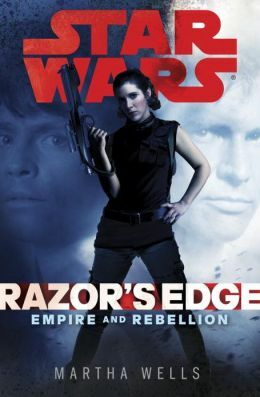 I tend to find Star Wars books somewhat hit-or-miss, but this first book in a new series was kind of in the middle for me. THE PLOT: The book takes place after A New Hope, but before The Empire Strikes Back. Leia and Han are on an Alliance mission, but get caught up with some half-hearted pirates…native Alderaanians who have survivor’s guilt. Then there are the deadly serious pirates, who capture everyone; and finally, the Imperials swoop in along with a spy set close to our heroes. Most of the book is from Leia’s point of view, with some from Han when they’re separated, and a teeny bit from Luke. (He’s not in it very much.) No Vader, no Emperor, not much Chewie. MY TWO CENTS: First, the good: this is really good time setting for Star Wars novels. Luke and Leia don’t know about their relationship to each other or Vader; Leia and Han are flirty but not yet serious. And what did they accomplish after the Death Star blew up, before Hoth? Also, this book allows Leia to shine on her own, both as a diplomat (her verbal battle with pirate leader Viest while trying to hide her body language, which Viest can read, is a high point) and physically (the arena battle she’s forced to fight). We’re reminded that this is the princess who blows holes in garbage chutes when her rescuers don’t have a plan. Then, the bad: Unfortunately, you know going in that everyone in the core group will come out okay, so there’s not as much tension. Also, if you’ve read far into the Expanded Universe future, you know the newly introduced characters aren’t important to any other story (unless there’s something I missed, which is always possible). You know they either end up dead or are just disposable. So this book is kind of just filler. It was a pretty slow read for me. It started out well, but I just kept falling out of the story. I wasn’t consistently into it. BOTTOM LINE: I would really only recommend this one if you’re a completist or a serious Leia fan. However, I will still check out the next book in the series, the Han book Honor Among Thieves by James S.A. Corey, which releases in March 2014.